A bottle of 26-year-old GlenDronach Scotch whisky signed by President-elect Donald Trump sold for £6,000 at auction, smashing its £2,500-3,500 pre-auction estimate. Bottled in 2012 to mark the opening of Trump International Golf Links in Aberdeenshire, the limited edition GlenDronach bottling was forecast to fetch between £2,500 and £3,500 at an auction held last Friday by McTear’s Auctioneers in Glasgow. Distilled in 1985 and aged in a Sherry cask, the whisky was of high interest to online, phone and in-room bidders, who were all outbid by a Canadian buyer willing to pay £6,000 for the bottle. 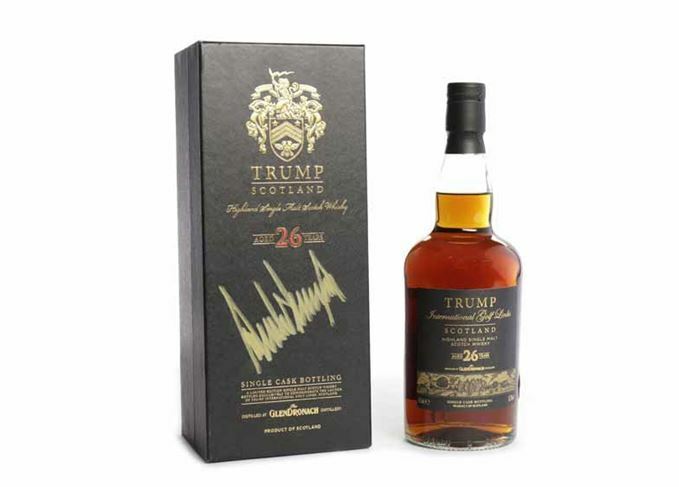 Last month, another bottle of the limited edition GlenDronach 26-year-old, also signed by Trump, sold on Whisky.Auction for £1,550, while another failed to sell after attracting a bid of £1,800 – below the £2,000 reserve price. Other whiskies auctioned by McTear’s on Friday included a 52-year-old Macallan 1950 which sold for £10,000, and a bottle of Black Bowmore 1964 which sold for £5,200 – slightly below its £5,500 estimate. A Millennium Collection of Springbank whiskies, comprising full-size and miniature bottles of 25-, 30-, 35-, 40-, 45- and 50-year-old single malts, sold for £10,000, not quite reaching its £11,000 estimate. Another Macallan, aged 18 years old, fetched £1,500. The money will be donated to the Earl Mountbatten Hospice in Newport on the Isle of Wight, which looked after the mother of the seller, who worked as a chef at Macallan for 30 years. More than 70 rare whiskies are for sale at the Worshipful Company of Distillers auction. Whisky.Auction will donate £200k from the sale of ‘exceptional’ whiskies to charity Plastic Oceans.